Cover of the first tankōbon volume of Grappler Baki, featuring Baki Hanma. Grappler Baki (Japanese: グラップラー刃牙, Hepburn: Gurappurā Baki), known as Baki the Grappler in North America, is a manga series written and illustrated by Keisuke Itagaki. It was originally serialized in Weekly Shōnen Champion from 1991 to 1999 and collected into 42 tankōbon volumes by Akita Shoten. The story follows teenager Baki Hanma as he trains and tests his fighting skills against a variety of different opponents in deadly, no rules hand-to-hand combat. The series was followed by three sequels in the same magazine; Baki (バキ, officially romanized as New Grappler Baki: In Search of Our Strongest Hero), which was serialized from 1999 to 2005 and collected into 31 volumes, Baki Hanma (範馬刃牙, Hanma Baki, officially romanized as Baki: Son of Ogre), which was serialized from 2005 to 2012 and collected into 37 volumes, and Baki-Dou (刃牙道, Baki Dō, lit. "Baki: The Way"), which was serialized from 2014 to 2018 and collected into 22 volumes. A fifth series, also named Baki Dou (バキ道, Baki Dō) but with Baki's name written in katakana instead of kanji, began on October 4, 2018. A 45-minute original video animation (OVA) was released in 1994. A 24-episode anime aired on TV Tokyo between January 8 and June 25, 2001, and was quickly followed by a second 24-episode series from July 22 to December 24, 2001. An Original net animation (ONA) was released on Netflix between June 25 and September 24, 2018, followed by an upcoming second season. The OVA was the first to be licensed and released in North America, in 1998 by Central Park Media, followed by the original manga series in 2002 by Gutsoon! Entertainment (incomplete), and finally both anime series in 2005 by Funimation Entertainment. Media Do International began releasing the second manga series digitally in August 2018. As of 2018, the first four Baki series had over 75 million copies in circulation. Baki Hanma is raised by his wealthy and money-obsessive mother, Emi Akezawa, who also funds his training in the hopes that he can be a powerful warrior like his father, Yujiro Hanma. Around the start of the series, Baki outgrows traditional training and heads out to follow the path of his ruthless father's training and meets many powerful fighters along the way. Eventually, Baki fights his father and is beaten without a challenge. After being beaten, Baki travels around the world continuing his training. Years down the road he finds an underground fighting arena where he fights some of the most powerful fighters of various styles of martial arts. It is here he truly begins to hone his martial arts skills. Grappler Baki (グラップラー刃牙, Gurappurā Baki) ― Original series, serialized in Weekly Shōnen Champion from 1991 to 1999. Collected into 42 volumes, that encompasses The Champion, the Kid, and the Maximum Tournament sagas. From 2007-2008 it was collected into 24 deluxe edition volumes. This series was licensed for a North American release by Gutsoon! Entertainment, who retitled it Baki the Grappler. They published the first 46 chapters in their English-language manga anthology magazine Raijin Comics. The magazine's first issue was released on December 18, 2002, but in July 2004 it was discontinued. 4 collected volumes were planned but it is unknown if they were released. Baki (バキ, officially romanized as New Grappler Baki: In Search of Our Strongest Hero) ― Second series, also serialized in Weekly Shōnen Champion from 1999 to November 24, 2005. Collected into 31 volumes, and encompasses The Prisoners, the Chinese Challenge, and the Ali Jr. sagas. This series is licensed for English release by Media Do International, who began releasing it digitally in August 2018. The company stated a future print release is possible and that they are interested in the original manga as well. Baki Hanma (範馬刃牙, Hanma Baki, officially romanized as Baki: Son of Ogre) ― Third series, again serialized in Weekly Shōnen Champion, began on December 1, 2005 and ended on August 16, 2012. Collected into 37 volumes, and encompasses the Oliva's Fortress, The Prehistoric Menace, Retsu Kaiou's Boxing, and the final confrontation of Yujiro and Baki. Baki-Dou (刃牙道, Baki Dō, lit. "Baki: The Way") ― Fourth series, serialized in Weekly Shōnen Champion from March 20, 2014 to April 5, 2018. Collected into 22 volumes. Baki Dou (バキ道, Baki Dō, lit. "Baki: The Way") ― Fifth series, began serialization in Weekly Shōnen Champion on October 4, 2018. It has the same name as the fourth, but with Baki's name written in katakana instead of kanji. It features Nomi no Sukune. Collected into two volumes. 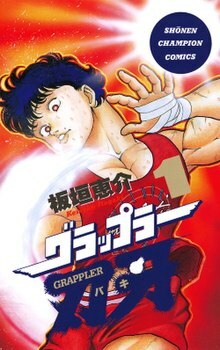 Grappler Baki Gaiden (グラップラー刃牙外伝) - Set immediately after the Maximum Tournament, it depicts a wrestling match between Antonio Igari and Mount Toba. Published in one volume in 1999. Baki: Tokubetsuhen Saga (バキ特別編SAGA, or The Romantic Contact Chapter) - Side story that develops at the same time as volume 15 of the second manga. One volume published in 2002. Baki Gaiden: Scarface (バキ外伝 疵面 -スカーフェイス-, or Scarface: Legend of the Invincible Fist) - Spinoff series, written and illustrated by Yukinao Yamauchi, depicting Kaoru Hanayama's yakuza adventures. Ran from March 2005 to December 2007 in Champion Red, then from July 2009 in Weekly Shōnen Champion. Collected into 8 volumes. Baki Hanma 10.5 Gaiden: Pickle (範馬刃牙10.5巻外伝ピクル) - Set after volume 10 of the third manga, it introduces Pickle. Published in one volume in 2008. Baki Gaiden: Gaia (バキ外伝 GaiA) - Spinoff series, written and illustrated by Hitoshi Tomizawa, starring Gaia. Published in Weekly Shōnen Champion in 2009. Baki Domoe (バキどもえ) - Comedic spinoff, written and illustrated by Naoki Saito. Originally launched digitally on Weekly Shōnen Champion The Web in 2010, then serialized irregularly in Weekly Shōnen Champion and finally Bessatsu Shōnen Champion until October 2014. Collected into 3 volumes. Baki Gaiden: Kizuzura (バキ外伝 創面) - Spinoff series, written and illustrated by Yukio Yamauchi, based on Kaoru Hanayama's adventures in high school. Began in Bessatsu Shōnen Champion in July 2012. Collected into 3 volumes. Baki Gaiden: Kenjin (バキ外伝 拳刃) - Spinoff series, written and illustrated by Kengou Miyatani, representing and describing Doppo's adventures. Began in Champion Red in June 2013. Collected into one volume. Yuenchi: Baki Gaiden (ゆうえんち〜バキ外伝〜) - A collection of tales that happen within the Baki world, written by author Baku Yumemakura, who includes characters from his own Garōden and Shishi no Mon novels, and illustrated by Keisuke Itagaki. Published in Weekly Shōnen Champion since in 2018. Grappler Baki: Red Dragon Side, Grappler Side - Compendium of the characters and events in the world of Grappler Baki, covers until volume 23 of the second saga. Grappler Baki: Blue Tiger Side, Fighting Side - Compendium of every battle fought and its results in the world of Grappler Baki, also covers until volume 23 of the second saga. A 45-minutes original video animation (OVA) was released in 1994. The story is a close adaptation of the first few volumes of the original manga, in which Baki Hanma fights Shinogi Koushou. It was licensed and released on DVD, under the title Grappler Baki: The Ultimate Fighter, in North America by Central Park Media on December 1, 1998. Manga Entertainment later released it in Australia and the United Kingdom. A 15-minutes original animation DVD (OAD), referred to as Baki: Most Evil Death Row Convicts Special Anime (バキ 最凶死刑囚編SP(スペシャル)アニメ), was included with the limited edition of the 14 volume of Baki-Dou on December 6, 2016. However, it adapts the arc of the same name from the second manga series, which is titled simply Baki. Created by Telecom Animation Film, it was directed by Teiichi Takiguchi and focuses on five inmates who breakout of prison from around the world and travel to Japan. A 24-episode anime series aired on TV Tokyo between January 8, 2001 and June 25, 2001. It faithfully follows the original manga series. Notably, the anime was produced by Free-Will, a music record label. A second 24-episode series, titled Grappler Baki: Maximum Tournament (グラップラー刃牙 最大トーナメント編) as it tells the story from that part of the manga, aired from July 23, 2001 to December 24, 2001. All of the series' music was written and composed by "Project Baki", and all the theme songs performed by Ryōko Aoyagi. The first anime's opening theme is "Ai Believe" (哀 believe), while its closing theme is "Reborn". For the second series, "All Alone" is used as the opening and "Loved..." as the closing. Baki the Grappler: Original Soundtrack was released on March 27, 2003. Both series were licensed for a North American English release by Funimation Entertainment. They released both series as one on 12 DVDs, each with four episodes, beginning on June 14, 2005 with the last released on February 27, 2007. Two box sets were released on January 23, 2007 and March 25, 2008, the first included volumes 1-6 (1st series), while the second included 7-12 (2nd series). A set including every episode was released on September 2, 2008. Funimation's English version was one of the launch-shows on their own television channel, Funimation Channel, which debuted on June 19, 2006. Baki was broadcast on weekends at 11:30pm, switching to the 10:00pm slot on September 4, 2006. Dubbed in English, the episodes were edited for time but do not appear to have been edited for content. The opening theme is the song "Child Prey" by Japanese metal band Dir en grey, who is signed to Free-Will. In December 2016, it was announced that the "Most Evil Death Row Convicts" arc of the second manga series would be receiving an anime television adaptation. Simply titled Baki, the 26 episode series is directed by Toshiki Hirano at TMS Entertainment with character designs handled by Fujio Suzuki and scripts overseen by Tatsuhiko Urahata. It began streaming on Netflix on June 25, 2018 in Japan, and started streaming on December 18, 2018 outside Japan. The series then started airing on several Japanese television channels beginning with Tokyo MX1 on July 1. Its opening theme song is "Beastful" by Granrodeo and its ending theme is "Resolve" performed by Azusa Tadokoro with lyrics by Miho Karasawa. Netflix renewed the series for a second season on March 19, 2019. There have been a few video games based on the series. A fighting game developed by Tomy was released for the PlayStation 2 as Grappler Baki: Baki Saikyō Retsuden (グラップラー刃牙 バキ最強列伝, Gurappurā Baki - Baki Saikyō Retsuden) in Japan in 2000 and as Fighting Fury in the United Kingdom during 2003. As of 2018, the first four Baki series had over 75 million collected volumes in circulation. The Baki Gaiden: Scarface spin-off series had 3.5 million copies in print as of February 2019. Allen Divers and Jason Thompson, both writing for Anime News Network, briefly described the series as "very compelling" and a "demented fighting manga", respectively. Anime News Network had four different writers review the first volume of the second manga series. Faye Hopper scored it the highest, four out of five, and wrote that she was captivated the entire read with its appeal lying in "its absurdity held up by its absolutely incredible artistry." Amy McNulty gave it a 2.5 rating and also praised Itagaki's art, but felt the character designs were not particularly memorable. She also wrote that the volume "succeeds in identifying the stakes, but it completely fails in anchoring the reader with characters to care about." Rebecca Silverman and Teresa Navarro both gave it a 2 and noted its status as a "set-up book," with each new character introduced in the same manner. Both Hopper and Silverman said that Baki reminded them of JoJo's Bizarre Adventure. Reviewing the first 24 episodes of the 2001 anime, Mark Thomas of Mania Entertainment gave it a B− rating, stating that fans of shōnen and fight series would enjoy it, but others should look elsewhere. He felt it had plenty of good, realistic fight scenes, but fell short on the story. Explaining that despite a lot of story arcs, it ultimately feels like a setup for the second season. Thomas gave the same rating to the final 24 episodes, and "mildly recommended" the series. While he started to enjoy this set more thanks to its more action focus, he stated that not showing Baki's final fight with Yujiro, which was built up the entire show, really ruined it for him. The 2012 comedy film Graffreeter Toki is based on the March 2011 play of the same name, which in turn was inspired by Grappler Baki. ^ a b "New Baki Martial Arts Anime's Trailer Reveals Staff at Telecom Animation Film". Anime News Network. 2016-09-21. Retrieved 2016-11-28. ^ グラップラー刃牙 1 完全版 (少年チャンピオン・コミックス) コミック. Amazon.com (in Japanese). Retrieved 2012-05-25. ^ グラップラー刃牙 24 完全版 (少年チャンピオン・コミックス) コミック. Amazon.com (in Japanese). Retrieved 2012-05-25. ^ "Raijin Comics Details". Anime News Network. 2002-05-20. Retrieved 2012-04-20. ^ a b "Baki Restarts". Anime News Network. 2005-12-05. Retrieved 2012-04-20. ^ "Media Do International Licenses Keisuke Itagaki's Baki Manga". Anime News Network. 2018-07-20. Retrieved 2018-07-24. ^ a b "Hanma Baki Manga to End in 10 Chapters or Less". Anime News Network. 2012-06-12. Retrieved 2012-08-16. ^ "New Baki Manga Series Titled Baki-Dou". Anime News Network. Retrieved 2014-02-10. ^ "New Baki Manga to Feature Japan's Legendary 1st Sumo Wrestler". Anime News Network. Retrieved 2018-04-04. ^ "Baki-Dou Manga Continues With New Serialization on October 4". Anime News Network. Retrieved 2018-12-09. ^ "バキ特別編　SAGA［性］". Akita Shoten. Retrieved 2018-12-16. ^ "バキ外伝　疵面　－スカーフェイス－". Akita Shoten. Retrieved 2018-12-16. ^ "範馬刃牙 10.5 外伝 ピクル". Akita Shoten. Retrieved 2018-12-16. ^ "Baki Gaiden - Scarface Manga Resumes After 5 Years". Anime News Network. 2014-09-12. Retrieved 2018-12-16. ^ "バキ外伝　創面". Akita Shoten. Retrieved 2018-12-16. ^ "Baki Manga Spawns New Spinoff in June". Anime News Network. ^ "バキ外伝　拳刃 第1巻". Akita Shoten. Retrieved 2018-12-16. ^ a b "Keisuke Itagaki's Baki Manga Gets TV Anime Adaptation". Anime News Network. 2016-11-28. Retrieved 2016-11-28. ^ "Baki The Grappler Site and Details". Anime News Network. 2005-05-06. Retrieved 2012-04-20. ^ "Baki the Grappler: Season 1 Box Set". Amazon.com. Retrieved 2012-04-20. ^ "Baki the Grappler: Season 2 Box Set". Amazon.com. Retrieved 2012-04-20. ^ "Funimation Syndicated Block Starts June 19". Anime News Network. 2006-06-07. Retrieved 2012-04-20. ^ "Funimation Doubles Syndicated TV Package". Anime News Network. 2006-08-24. Retrieved 2012-04-20. ^ Pineda, Rafael Antonio (March 14, 2018). "Baki Anime's Teaser Video Reveals Main Cast, Staff". Anime News Network. Retrieved March 14, 2018. ^ "Netflix to Stream New Baki Anime Series". Anime News Network. August 2, 2017. Retrieved August 2, 2017. ^ "Netflix Premieres New Baki Anime Series in Summer 2018 in Japan, in Fall 2018 Outside of Japan". Anime News Network. August 26, 2017. Retrieved August 26, 2017. ^ "Brawny Brawlers Trade Brutal Blows in "Baki" TV Anime Trailer". Crunchyroll. June 9, 2018. Retrieved June 10, 2018. ^ "GRANRODEO Performs OP Theme for New "Baki" Anime". Crunchyroll. April 19, 2018. Retrieved June 10, 2018. ^ "Fighting Fury for the PlayStation 2". MobyGames. ^ "新アニメーションシリーズ『バキ』2018年6月25日より、NETFLIXにて先行配信スタート！ 2018年7月1日より、TOKYO MX1ほかにてTV放送開始" (PDF) (in Japanese). TMS Entertainment. p. 2. Archived (PDF) from the original on 2018-08-03. Retrieved 2018-08-02. ^ "Roundup of Newly Revealed Print Counts for Manga, Light Novel Series - February 2019". Anime News Network. March 3, 2019. Retrieved March 3, 2019. ^ Diver, Allen (December 31, 2002). "Ima, kore ga hoshiin da! - I Want It, Manga Style!". Anime News Network. Retrieved February 12, 2014. ^ Thompson, Jason (October 20, 2011). "Alien Nine - Jason Thompson's House of 1000 Manga". Anime News Network. Retrieved February 12, 2014. ^ "BAKI - The Fall 2018 Manga Guide". Anime News Network. 2018-12-03. Retrieved 2018-12-18. ^ "Baki the Grappler Box Set 1". Mania Entertainment. 2008-08-29. Archived from the original on 2014-06-05. Retrieved 2018-12-18. ^ "Baki the Grappler Box Set 2". Mania Entertainment. 2008-09-23. Archived from the original on 2014-06-05. Retrieved 2018-12-18. ^ "Baki Manga-Inspired Graffreeter Toki Film Trailer Posted". Anime News Network. 2012-03-22. Retrieved 2012-04-20. This page was last edited on 22 April 2019, at 21:52 (UTC).